It’s time to get down in London Town! With the London Drink Ticket, you’ll have a smooth flowing event on tap. 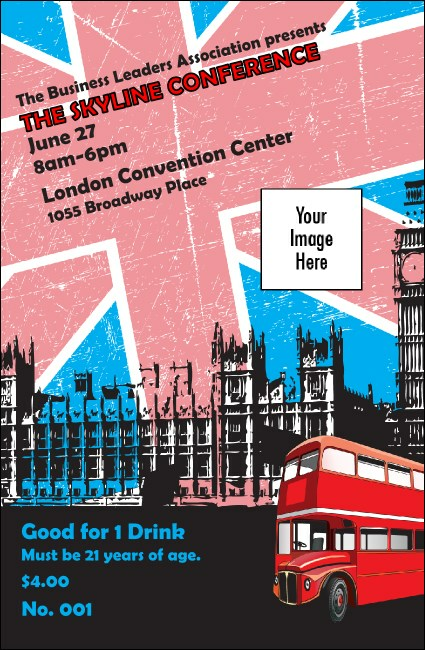 Perfect for any occasion hosted in London, the ticket features a distressed image of the Union Jack and Big Ben in the background. Keep your bartenders and guests relaxed when you sell drinks early! Like this design? Go full monty! A matching event kit is available through TicketPrinting.com.